Happy Halloween! Whilst I said yesterday it felt like Halloween was over, I got back into the spirit today. We bought soooo many sweets for trick or treaters because we live right near a school, and we didn't get a single one! I'm guessing the creepy ghouls we've got stuck to our windows were too much, who knows? Anyway, my final Halloween design is hopefully a bit less spooky, but still on theme: black cats! To the horror of my boyfriend (he definitely prefers dogs), cats are my favourite animal and would be my pet of choice, so it seemed fitting to paint them on my nails this halloween. 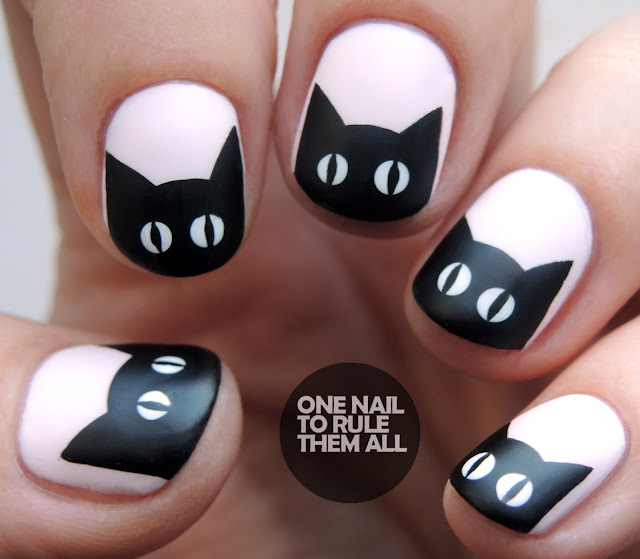 This isn't the first time I've done black cat nails (see here), but it is the first time I've done them this way, and I love the combination of pastel and black. 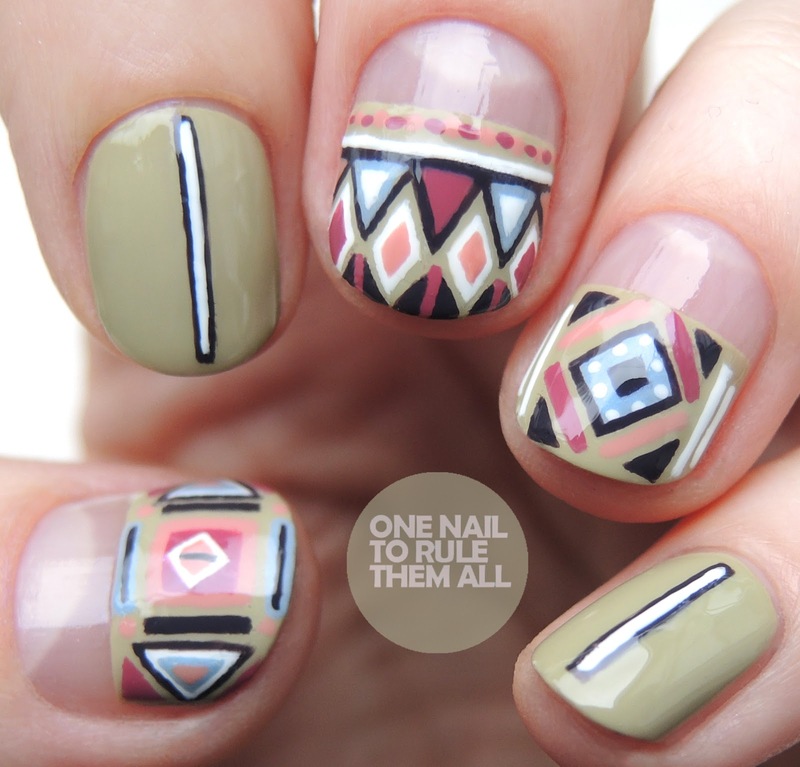 This was my last design in collaboration with Barry M, I hope you've enjoyed them! I used Barry M - Rose Hip* as my base, and then I used Barry M - Black Forest* and Barry M - Cotton*, finished with Barry M - Matte Topcoat*. After my Halloween party this weekend it kind of feels like Halloween is done and dusted, but it's good job it isn't because I've still got two designs to show you! 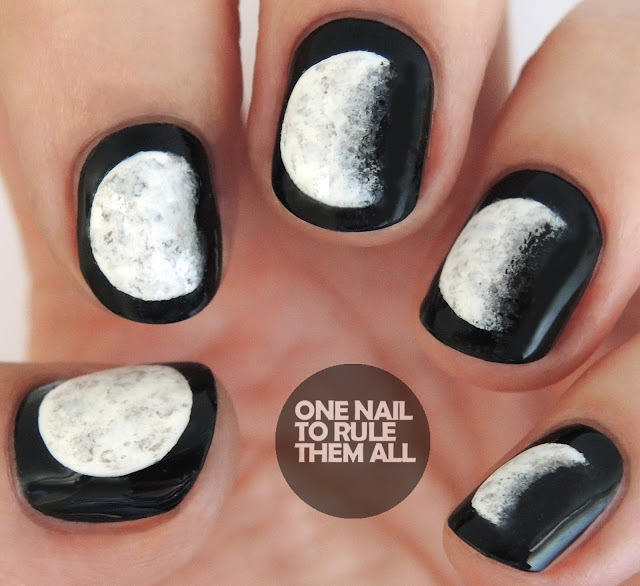 The first of the two is these moon phases nails. I've seen this design done a few times so I'm not sure who originated them, let me know if you do! They're such a cool idea, I couldn't resist trying them myself. They took a lot of perfecting to make sure they were right, I must have sponged that gradient on at least 10 times per nail, but I was so pleased with the final result. These nails were created as a collaboration with Boots and Barry M, so keep an eye on Boots social media to see how to create these! It's almost the weekend, and that means one thing... halloween party! I'm so excited. This is the first proper party we've hosted in the new house so I'm really looking forward to it, and I can't wait to put halloween decorations up tomorrow. As I mentioned in my last post, I've got quite a few halloween designs to post, so here's the second one I created for Barry M: pastel bats. These were a combination of different ideas I'd seen on Pinterest. 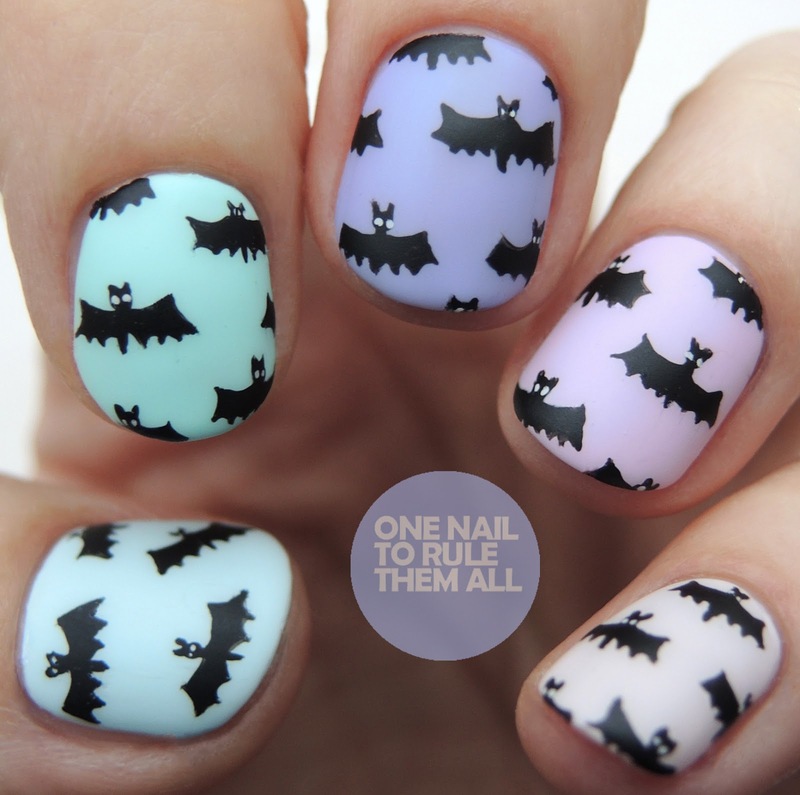 I loved the idea of an ombre effect on the nails, and I'd seen a few mini bat designs, so I combined the two, and I really love how these turned out. I can't wait for halloween this year, I'm really looking forward to having the house decorated for our halloween party next week, and I'm already counting down. Last year I didn't really get the chance to celebrate halloween, so I'm planning on going all out this year, and that means getting my nails ready for the occasion. Luckily, Barry M asked me to create some halloween tutorials for them, so I've got quite a few designs to show you before the big day! 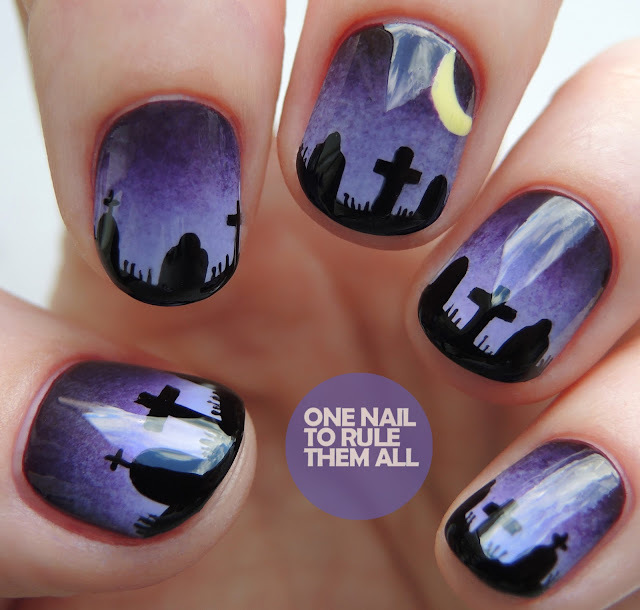 First up is this gradient gravestone look. I won't pretend it's not a design that hasn't been done a million times, but I like to think there's a reason it's done so often. It's such a typical halloween look, but I love it. After a busy weekend of doing absolutely nothing except painting nails and eating (what could be better? 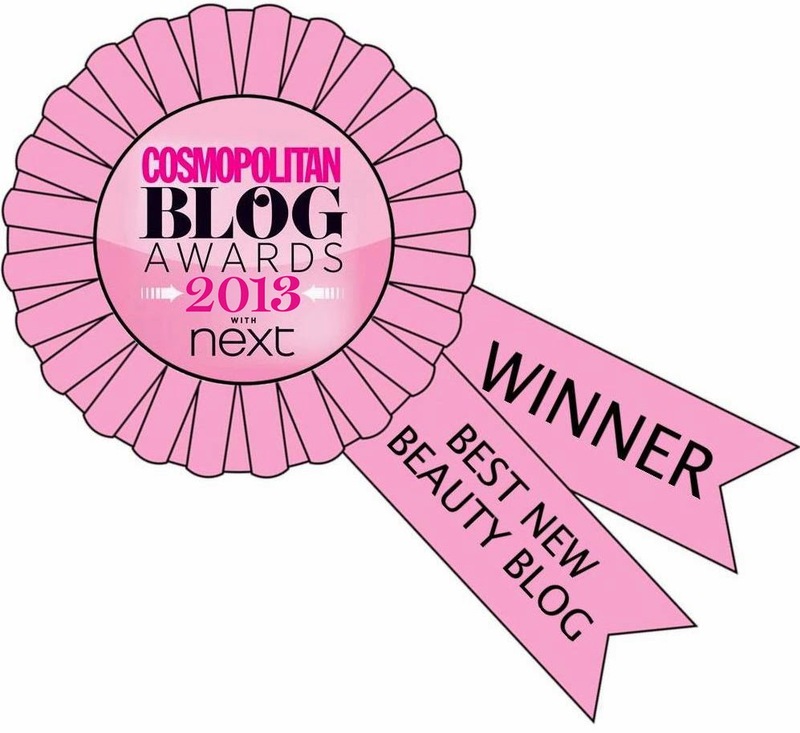 ), it feels right to end it with a blog post. It's a super exciting week for me as I'm off to see Harry Potter and The Cursed Child next weekend, plus we're off to the Warner bros studios, I can't wait! I bought the tickets for the play more than a year ago, so it's been a long time coming. Anyway, on to the nails! It's been so long since I last did a Gelish review, in fact it's been pretty much exactly a year, and boy have I missed reviewing their gorgeous gels. So when I got the new Little Miss Nutcracker* collection to review, I wanted to show you them as soon as I could. I'm well and truly in the festive spirit this year already, I know it's super early but I think because I had such a miserable time last Christmas it just feels all the more exciting this time around, and I already can't wait to decorate my house! 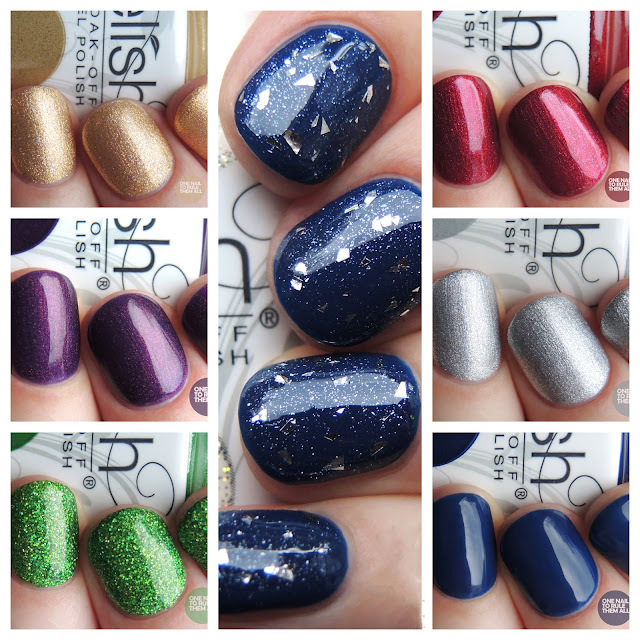 The collection features 6 gorgeous shades, plus a lovely glitter topper to complete the collection. They're all such wonderful Christmassy shades, but I think my favourite must be Plum-thing Magical*, because it really is (some)thing magical! This was also my first time trying to new Gelish bottles. When I first saw they'd changed I was a little sad, as I really loved the old design, but having seen them in person I really like them, and it's so much easier to see which colour you're picking out!